Remember Tarzan of the Apes? Well, apart from being made the subject of countless movies, cartoons and plays, he has also made his way into the video games and slots world. 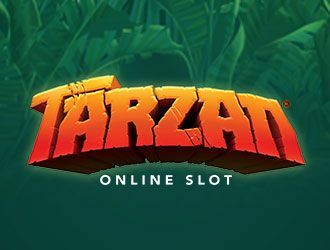 One such slot is the Tarzan slot released by Microgaming. This stays faithful to the original story, has top-class graphics and animation effects, as well as quite a list of bonuses. Do read on for more details of all that’s on offer. This online slot rocks five reels, as well as 40 paylines. It, of course, derives its theme from the Edgar R. Burroughs novel of the same name and the setting is a small jungle clearing. To the left of the reels, the heavily muscled and sinfully handsome Tarzan stands ready for action and the other icons include old familiars like Jane, the tiger, some explorers, fruits, a bird and a monkey. An Autoplay mode is fully supported here and can be set to spin for a desired period. The wild icon is the Tarzan logo and it replaces all other icons apart from the scatter. This icon appears in a stacked format during both base gameplay and the free spins mode and can form winning combos independently when more than 3 end up on a winning payline. The bonus icon in the slot is a wheel and it can potentially form scatter wins when two and up are landed anywhere within view. Landing at least a trio of the scatter icons on the reels activates the Bonus Wheel feature. This contains things like free spins, cash awards, a jackpot that can reach 1000x the bet and the Pick-A-Potamus bonus. If the free spins are awarded, players can look forward to being given a dozen free spins, with these being equipped with both growing wilds and rolling wilds. Incidentally, the Growing Wilds are so called because they add an extra wild icon on each consecutive spin. The Rolling Reels feature, on the other hand, is good for consecutive wins. As for the Pick-A-Potamus bonus, players are obliged to pick from the hippos on the screen to find those that hide multiplier values. The slot is a beautifully designed and decidedly feature-packed effort that pays proper tribute to the greatest man who ever tied a loin cloth and swung from a tree! The bonuses on offer are varied and entertaining, as are the gameplay features.